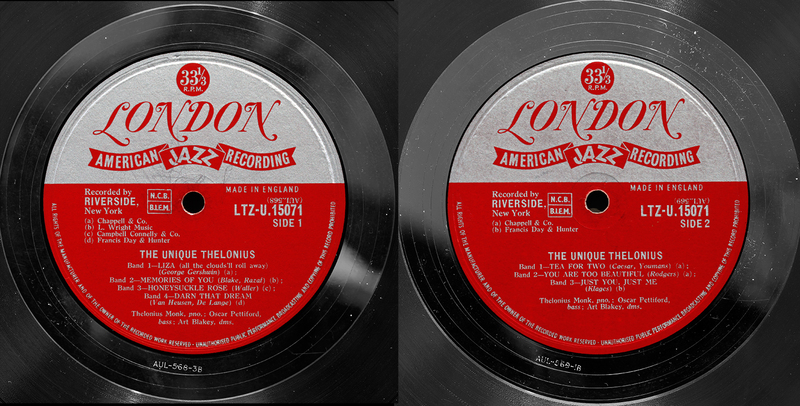 Monk was signed by Orin Keepnews to his Riverside label in 1955, and like Monk’s Riverside debut, Thelonious Monk Plays The Music Of Duke Ellington (Riverside RLP 12-201) The Unique Thelonious consists only of standards. It marked a continuation of Keepnews’s strategy to broaden consumer interest in Monk by having him record cover versions of well-known material which, Riverside hoped, would help to break down the prevailing perception that Monk’s original music was “too difficult” for mass-market acceptance. Featuring strong performances from Monk and his early group members, Art Blakey and Oscar Pettiford, the album itself is sometimes overlooked. 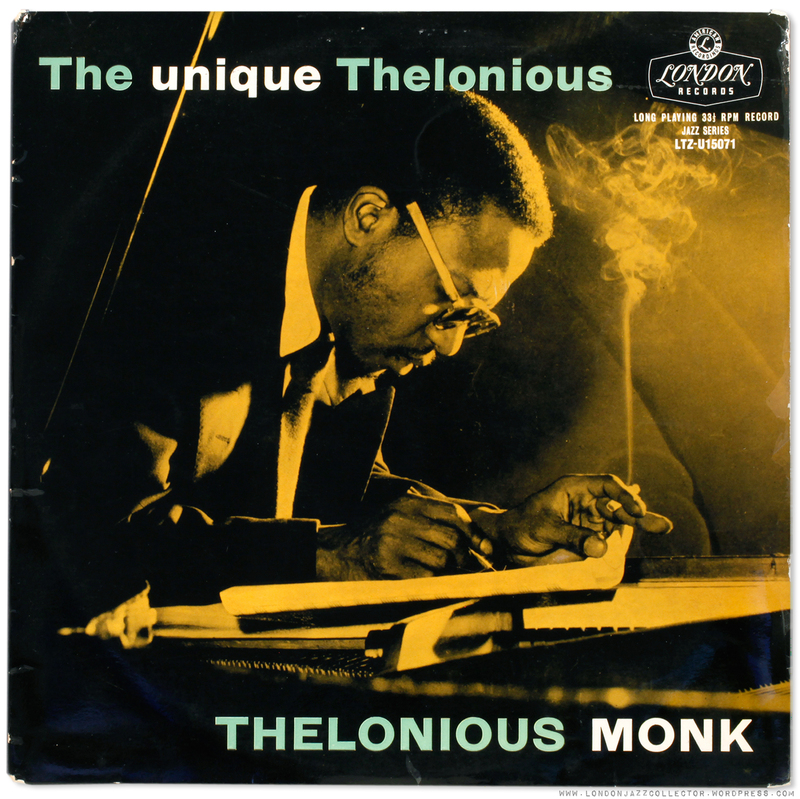 Without the benefit of the forceful compositions of Monk’s later recordings, we are offered instead deceptively familiar standards, which are then subjected to Monk’s unique approach to melody, harmony and tempo. At times it is like letting Nightmare on Elm Street’s Freddie Kreuger loose in Santa’s Grotto. Jazz critics consider his following Riverside release, Brilliant Corners, the must-have, but for it’s subversive delights, Unique is a strong contender. Indeed, the problem for the critic is that ultimately all Monk’s recordings are must-have. In the notes to The Complete Thelonious Monk on Riverside, producer Orrin Keepnews recalls overhearing the pianist preparing a sideman for a recording session. “Don’t pay too much attention to what I’m playing behind you,” Monk cautioned. “Because when we record I’ll probably be playing something completely different…” As always with Monk, expect the unexpected. UK first release on Decca’s London label, with pressing by Decca, New Malden.The atmospheric cover photograph of Monk is probably on of the finest advertisements FOR smoking ever seen: beautiful duotone printing, side-lit profile, creative genius scoring music (he can write!) while whisps of cigarette smoke curl in the darkness, let down only by the absent hat. The Decca matrix suggests an unusual production history: 3B/1B. “B” was Decca’s regular engineer on jazz recordings, Ron Mason. Side One appears to be a third attempt at mastering the recording. Bad day at the plant, Ron? Not withstanding production probems over the tea cakes in New Malden, Decca pressings are very good. I hesitate to say it, but on albeit limited experience, often better than US Riverside. Decca New Malden, yeah! A shop I visit from time to time, sometimes something of interest, sometimes, not. Pulling the cover from the rack, it was immediately recognised as I walked with it over to the counter. Great record, I was listening to it only last night, said the manager. He knew the vinyl shelves were full of mostly so-so stuff, and row after row of The Evil Silver Disk which most customers are buying, he’s running a business, however this was something special that had just come in. Special enough to take home for personal listening. That’s why I could never work in or run a record shop. I would refuse to let the good stuff go. Keep your money, it’s mine. 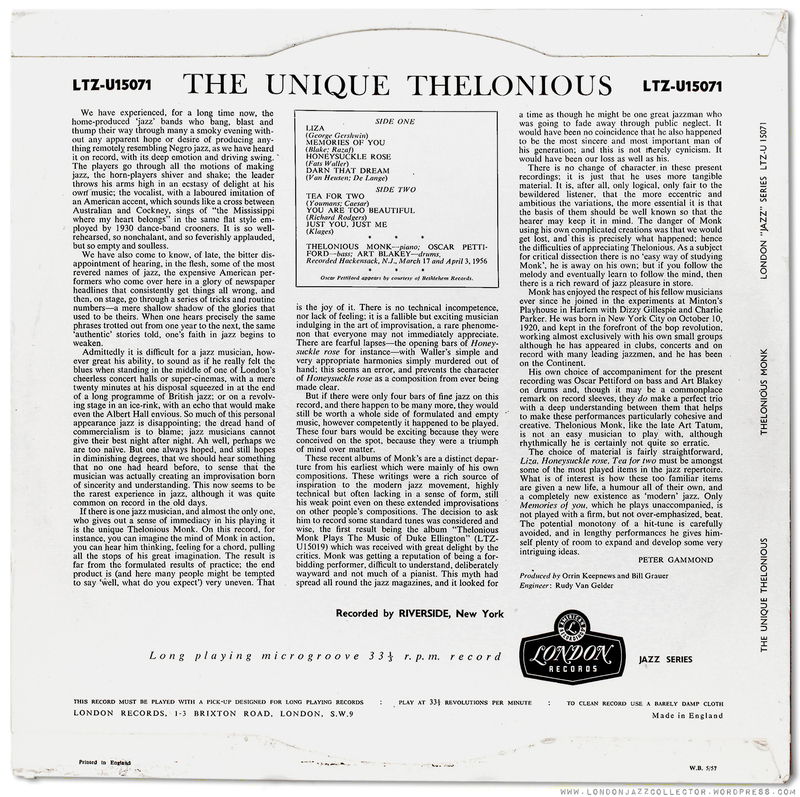 This entry was posted in London, Thelonius Monk and tagged Thelonious Monk by LondonJazzCollector. Bookmark the permalink. Ken Braren, who with Paul Bacon, designed album covers for Riverside, gave me an unplayed copy of the Monk “Unique” stamp album. Ken also gave me six of the promo stamps mounted, framed, and signed by himself. Ken told me Riverside discontinued the promo stamps after a visit to their offices by the FBI. His signing the framed stamps for me was most unusual. Besides doing children’s books, Ken was an artist. He told me he NEVER signed any of his work, much to the exasperation of his older brother, who bought a number of his paintings. The stamp collector at Riverside Records was Bill Grauer, who specialized in African 19th century stamps. Ken was a martial arts specialist and could speak fluent Japanese. He and his wife were married at a Shinto shrine in Japan. On his mother’s side, Ken and his two brothers are related to Bix Beiderbecke. Both Ken and Paul Bacon are now deceased. Great to hear there was some direct relationship, if you pardon me for stretching things a little, between Bix and Riverside Records! One of my most cherished Riverside covers is “Bix Beiderbecke and the Wolverines”, done by Paul Weller and Paul Bacon. my mistake Aaron: I’m sure it was in Haight St. location but the record was Riverside 12-201, Monk Plays the Music of Duke Ellington, the other one that had the cover changed. the date was March 22nd, 1997.
as I’m going back to Frisco this week, can anyone suggest some good shops in the bay Area? I haven’t shopped for records in the bay in years but aside from Amoeba (both locations) and Rasputin’s I definitely wouldn’t miss Groove Yard in Oakland. It’s a great jazz only shop and I always used to find nice records there. thanks a lot Aaron, I’ll go there for sure. Another great record on London is Byrd s Word originally released on Savoy records. Great line up with Frank Foster on tenor. The sound quality ís perfekt. I was lucky two years ago when I found an M- copy of this recordon ebay. The buy it now price was fair and I really like the British cover art. My copy has exactly the same matrix numbers as yours. I also bought a scratched Riverside first pressing a few years ago because I liked the cover. Unfortunately I cant compare the sound quality, because my Riverside copy is not music with some background crackling, but crackling with some music in the background. Have not played the Decca copy in a while – will listen to it tonight. This is another Monk that I don’t have. Love trio records like this, I just played the audio clip for the third time. The good thing about the evil silver disk, is that there’s such an enormous amount of jazz out there for less than a few quid/bucks/euro per disc nowadays, that I almost weekly run into a super cheap reissue on CD. Latest acquisition: “Monk Alone, The Complete Columbia Solo Studio Recordings 1962 – 1968”; a marvellous Columbia/Legacy double CD for less than 9 euros. This one was my first Riverside LP and my first Monk record. I also found mine on the wall of record store although I probably paid too much for my pressing (2nd cover, DG, large blue label) as it was the first Monk on Riverside LP I had ever seen in person and I had to take it home. BTW, dottorjazz, was that the Amoeba in Berkeley? I thought the one in SF on Haight only opened in the 2000s? Was there another location in SF earlier? It’s very interesting to see your comments on the Decca mastering of this title. Its fascinating to see how a particularly non-jazz oriented label like Decca handled mastering jazz records. It’s also interesting to note that this is a very rare case of Rudy Van Gelder doing the recording but not the mastering (in fact, I’m not aware of any other case of RVG recording at Hackensack and not cutting the master himself). I’ve been looking at Riverside pressings recently and trying to make some sense out of the runout markings. At this point, the one indicator I have found is that most of the original masters I have seem to have an “RI” etched in the dead wax (the patent markings often found on original pressings seem to belong to the stampers and not the master). The good news of this discovery is that the original masters seem to have still been in use during the post-Bill Grauer (after 1963) “Orpheum Productions” phase of the Riverside Label. Using this knowledge, I was recently able to snag a Teal label copy of “Sunday at the Village Vanguard” with the original sleeve and pressed from the original master. My pressing of this title seems to be a remaster (it has no “RI”, but it does feature an etched “AB” for Abbey Record Mfg.). Mingus allegedly refused to have RVG record this session because “he changes your sound”. This accusation must have particularly annoyed Van Gelder who has always stated his goal was to “record the musicians the way they want to be heard”. Personally, I have always wondered if there might have been a different explanation: that perhaps there was some reluctance on the part of Van Gelder to participate in the non-trivial amount of overdubbing that was employed in creating that album (RVG had assisted Mingus many years earlier in overdubbing bass in the famous Massey Hall concert recording on Debut due to the fact that the bass on the original recording was almost inaudible). This is also the only instance I know of an issued RVG recording outside of his own studio. As for the cover art: while I really like the Decca version, my favorite is still the 2nd U.S. cover with the postage stamp. When this version was originally issued, Riverside actually printed up and distributed real blocks of stamps with this image as a promotional gimmick. As the story goes, the stamps subsequently ended up on letters which were then delivered by U.S. post office employees who were presumably too busy to notice the not very convincing “33 and 1/3” postage value of these “stamps”. The Riverside info is fascinating. 28 of my 36 Riversides are UK or NL pressings – mastered locally – US imports are pretty rare and the scratchings in the runouts of those I have are very faint. I have a recollection of seeing “RI” somewhere. I’ll look out for it, starting with my two Orpheums. Even the French say on their products “Made in France”. On this record in the dead wax however it reads “Manufactured in Germany”, which sounds quite unusual to my ears. The lettering reminds me of a Teldec production. Forgot to mention that my German London does not have the DG as the ones produced in England. It has got a small DG close to the pinhole, the diameter of an old 1 p. coin., or rather 2 1/2 p.
I have never understood why a record made in Germany proclaims it is “Made in Germany” in English and not ‘Ich bin ein Berliner, noch ein Bier, bitte” or some suitable local expression. Teldec and DeutcheGramaphon have an awsome reputation if it is them behind the pressing. My London copy of “Monk plays Ellington” LTZ-U15019, manufactured in Germany, has AUL 348 in the dead wax (and also “Manufactured in Germany”). Comparing this copy with the re-issued and re-packaged Riverside RLP 12-201, I cannot say that the German London is better than the US Riverside. Orrin Keepnews has the decency to say that they have re-packaged the album.Riverside choose the painting of the douanier Henri Rousseau “le Repas du Lion”. Nice as it is, no real link with the music though. Because of my admiration for Ellington, I prefer this selection of Duke’s compositions to the standards on RLP 12-209, although in absolute terms both records have the same artistic value. That’s a beautiful cover. Like you I love everything I’ve heard by Monk so I think I’ll seek out a copy of this on London with that stunning artwork. I still check your blog every other day and enjoy it immensely! P.S. A request for the new year…how about a review of Brubeck’s Jazz Goes to College (Philips ’55) if you own it? I put it on the other night and was spellbound by Paul Desmond’s wonderful playing. Thanks John, cheers. I regret you have hit my blindspot with Brubeck. I don’t have even one of his records (stunned silence! pin drops! muffled gasp of surprise! ).His were the first jazz records I ever owned as a teenager – Time Out and Futher Time Out – played them until the light shone through – and I never felt I wanted to go back to him. One request I can’t do, but if you feeling lucky you have two more shots left. My wife will be horrified (drops champagne glass and clutches pearls). Brubeck is her favorite; aside from the music, she met him once, and, not surprisingly, he was a gentleman. His catalog – particularly the prime Columbia years – definitely suffers from “million records a year” syndrome; there is so much (and, let’s be honest, even to fans a lot of it is not essential), it all tends to get drowned out. However, we have a few on Fantasy to which even I’m partial. Jazz At Storyville, Fantasy 5230, in particular is very nice (per John’s post, Desmond sounds amazing on that one). We have a red vinyl original pressing that, miraculously (a) is completely clean, and (b) sounds pretty good (Fantasy colored is notoriously difficult to find clean and, even when clean, sounds thin). However, I agree in the main; he was a tremendous credit to American music in general, and jazz in specific, and yet I don’t often reach for his LPs. How about a review of Thelonious Monk: Work! on Esquire? What kind of inner sleeve would a 1959 UK Esquire LP like that come in? Could you post a picture perchance? Is the sound clip your record?? It’s quiet as hell! Fresh rip now up – beginning to see why the engineer was having problems with mastering – the pressing is surprisingly low gain: I’ve now pushed it up to double and it now sounds more “normal”. Thanks for the heads up. That’s funny, I had a feeling my wording might be confusing. I used the word “quiet” with haste, I meant the record sounded like it had very little surface noise, and that it sounded great ha. I’ve noticed that “quiet” has a double-meaning in the record collecting circle, but I’ve always intuitively used it referring to surface noise. You were right in both senses of the word “quiet”. Isn’t that nice, to be double right? “Indeed, the problem for the critic is that ultimately all Monk’s recordings are must-have.” Dear lord, that is so true. I often look at our shelves and think “geez, we’ve got a lot of Monk records,” and then, invariably, the next week I see one we don’t have that we must have. And the Monk section grows and grows. I got my original Riverside in San Francisco’s Amoeba in 1993. I saw it on the wall and asked to see it. White label, first cover: I got it home and still love it. I’m guessing it was the Berkeley location you found this at as the San Francisco store didn’t open until 1997. Nice score on the first pressing, never seen one in person myself!